we were given it as a wedding present and offloaded it .. nope! there is another Lucy & Paul somewhere out there and they offloaded it .. maybe. 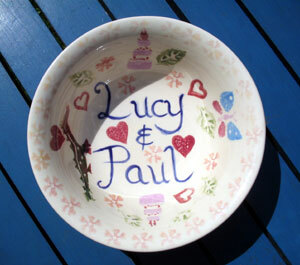 the parallel L&P got divorced and it was one of the few items Lucy didn’t hurl across the kitchen at Paul .. quite likely! My mother actually commissioned it from a cheesy advert in the back of Torygraph Saturday magazine but is too embarrassed to admit to it .. i think we have a winner! Anyway, the real Lucy has just filled it with brazil nuts .. yum! A Whatfettle article by Paul Downey published Saturday, July 24th, 2004, at 3:31 pm under a Creative Commons License.